If you happen to be at the SQL PASS conference this week in Seattle, you will find us presenting the new version of the Predixion Insight package. We added rich collaborative features and completely new visualizations. In the previous post I presented a not-so-documented cell function installed in Excel by the data mining add-ins. Jamie also gave some cool demos featuring these functions. To complete this topic, here is a full description of the cell functions and how they can be used. The Excel Data Mining Client add-in includes 3 cell functions: DMPREDICT, DMPREDICTTABLEROW and DMCONTENTQUERY. These functions are included in the add-ins for SQL Server 2005, but not documented or supported. 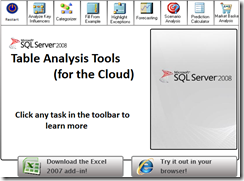 However, they will be both documented and supported in the add-ins for SQL Server 2008. To use these functions, you will need a mining model available on the server. For the examples below, I created a Microsoft Decision Trees mining model, built by running the Classify task in the DM Client add-in over the sample Table Analysis Tools Sample spreadsheet in the sample workbook installed by the add-ins. A recent post on the MSDN Forums raised an interesting issue: Excel Data Analysis’s Linear Regression and SSDM were returning different results. Specifically, the SSDM results were much worse. The issue turned out to be a data modeling issue (columns were not mapped properly). However, during the investigation I had to compare Excel’s linear regression with the SSDM regression algorithm(s). Thought this might be interesting, so here is one way to compare the results from the two implementations. Next thing, I created a Microsoft Linear Regression mining model on the same data. There is a variety of ways to do this, such as exporting data to a table, connecting directly to the Excel spreadsheet or, the simplest way, by using the Excel add-ins. To get the model’s predictions in Excel, I used one of the functions exposed by the Excel add-ins, DMPREDICT. If you do not have the add-ins you can always execute a prediction query in SQL Server Management Studio or BI Dev Studio.